Based on the price point and difficulty of snagging a reservation alone, this definitely falls into the “Special Occasion Restaurant” category. Save this one for when you’re celebrating a birthday, anniversary, or any other major occasion worth celebrating and spluging for. Bubbledogs. 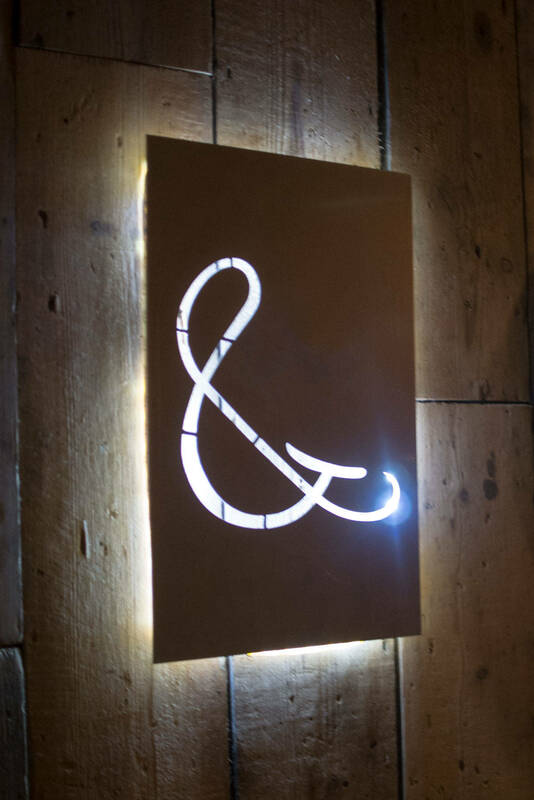 Look for the “&” to find Kitchen Table. 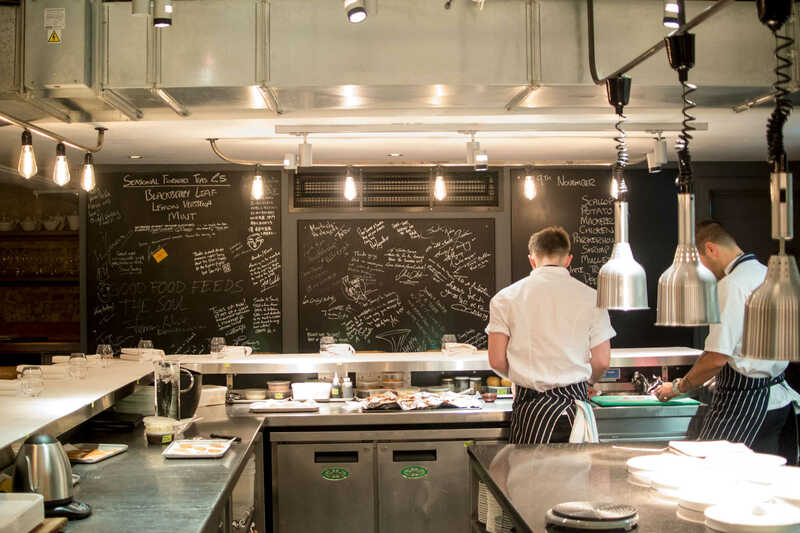 While the atmosphere is personal and casual once you’re seated around the 19-seat U-shaped chef’s counter, but there’s certainly a level of formality to the experience. 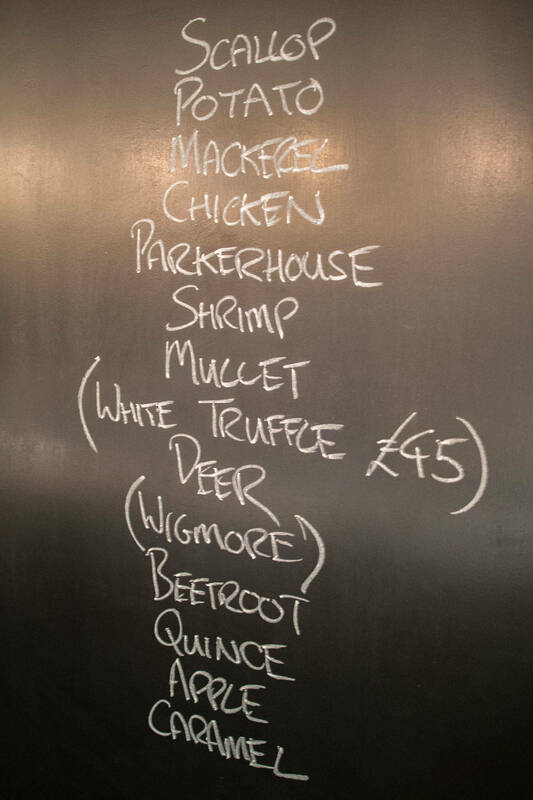 When you arrive at one of the two nightly seatings, the daily changing menu will be written on a chalkboard with a single word describing each of the 13-15 courses featuring meticulously sourced and foraged British ingredients. 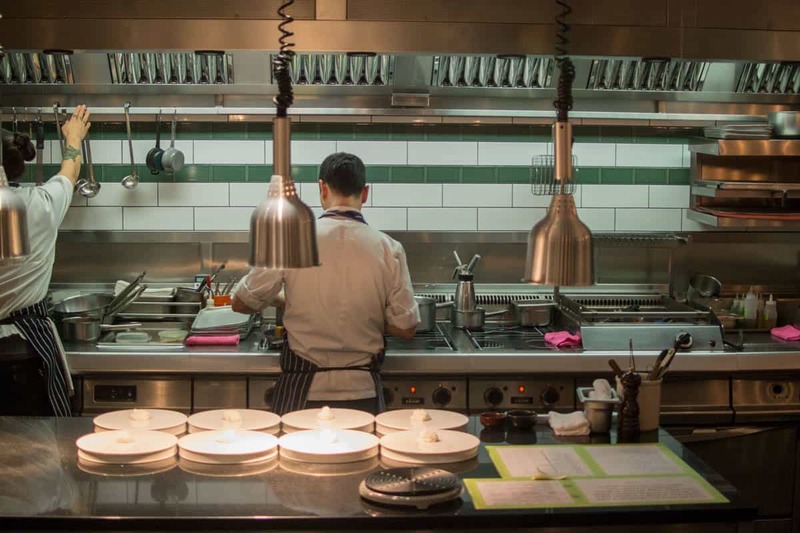 The kitchen employs an array of fancy molecular techniques to great effect. 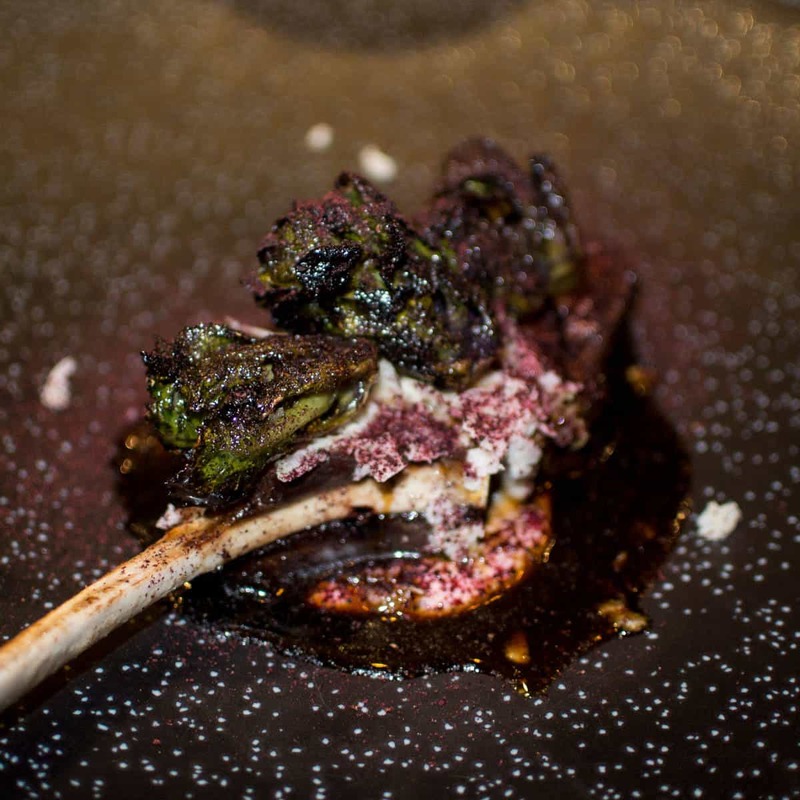 Whereas I found the molecular cooking at Wylie Dufresne’s WD~50 to be a little light on flavor and a bit showy, that was not the case here. At Kitchen Table every dish was loaded with bold flavors and textures and nothing felt like it was done extraneously or just for show. 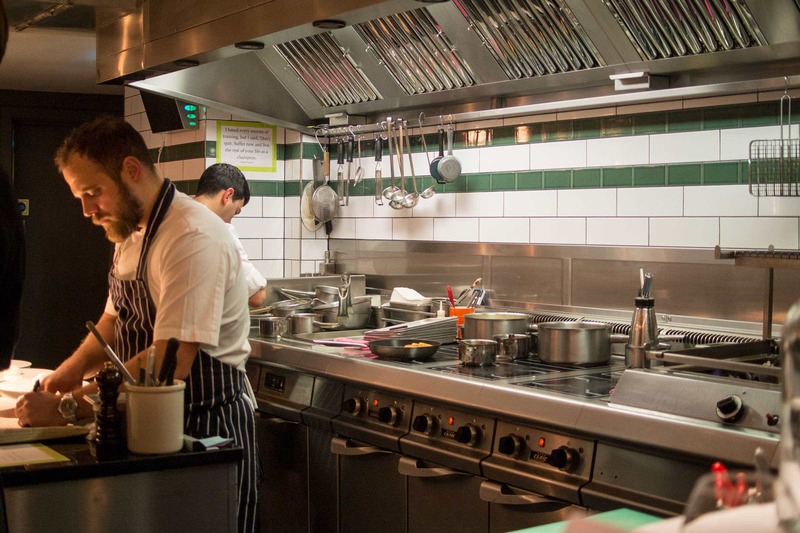 As each course was presented, a lengthy description of the ingredients and method of preparation was given and if you still had any questions, the kitchen staff was more than happy to stop over and answer them. 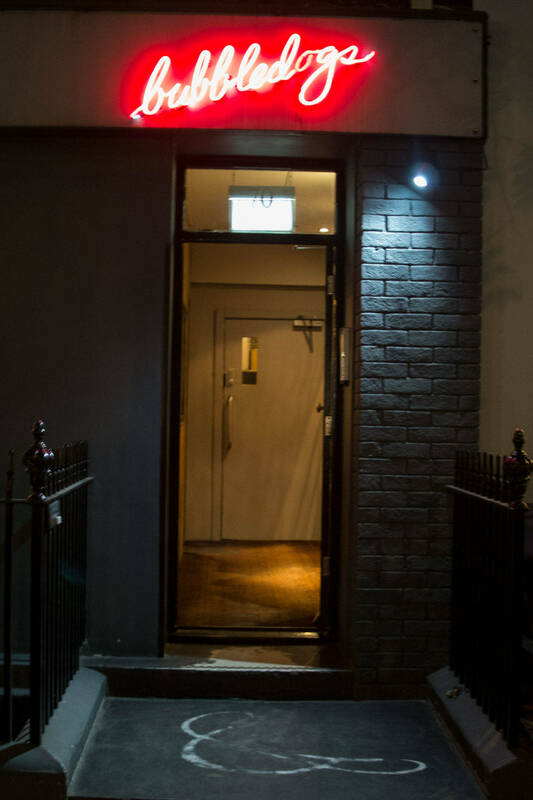 This was an extraordinary dining experience worth the price of admission and certainly worthy of its awarded Michelin star. The minuscule dining room featured an assigned sommelier who was there to help guide beverage selections. 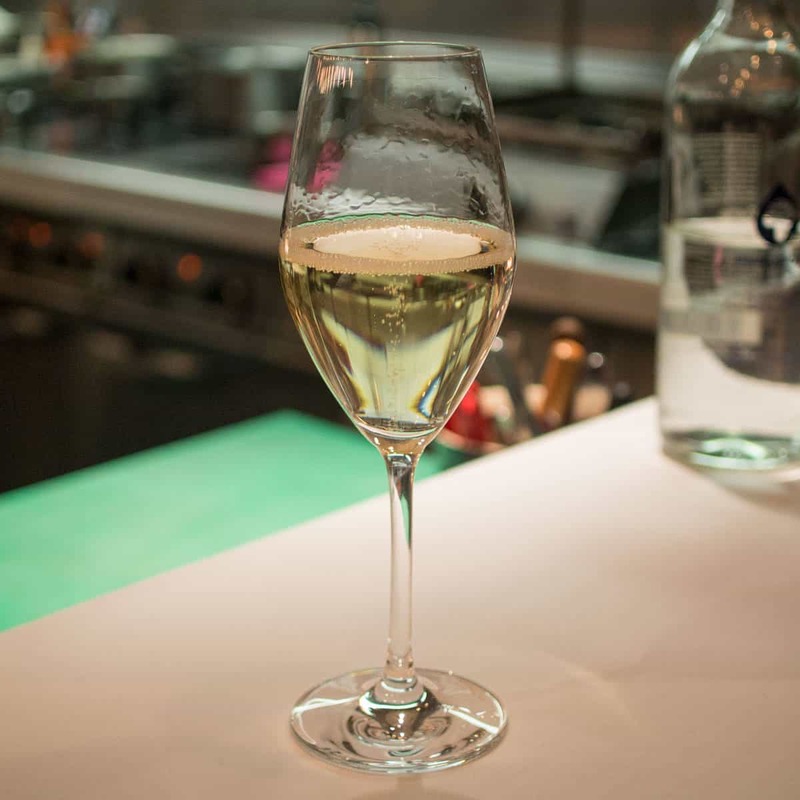 Since the casual shop out front features fancy hot dogs paired with champagne, it only makes sense that Kitchen Table would also offer an impressive selection of champagnes. 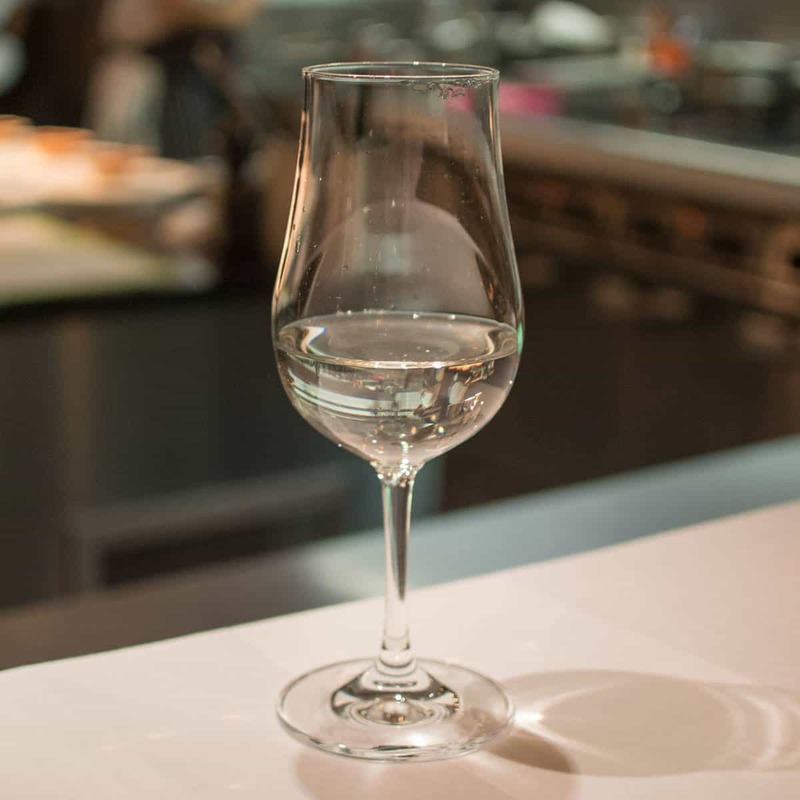 Additionally, they offer a great selection of sake, beer, wine, and a number of mixology-style cocktails along with an optional drink pairing to accompany the food. 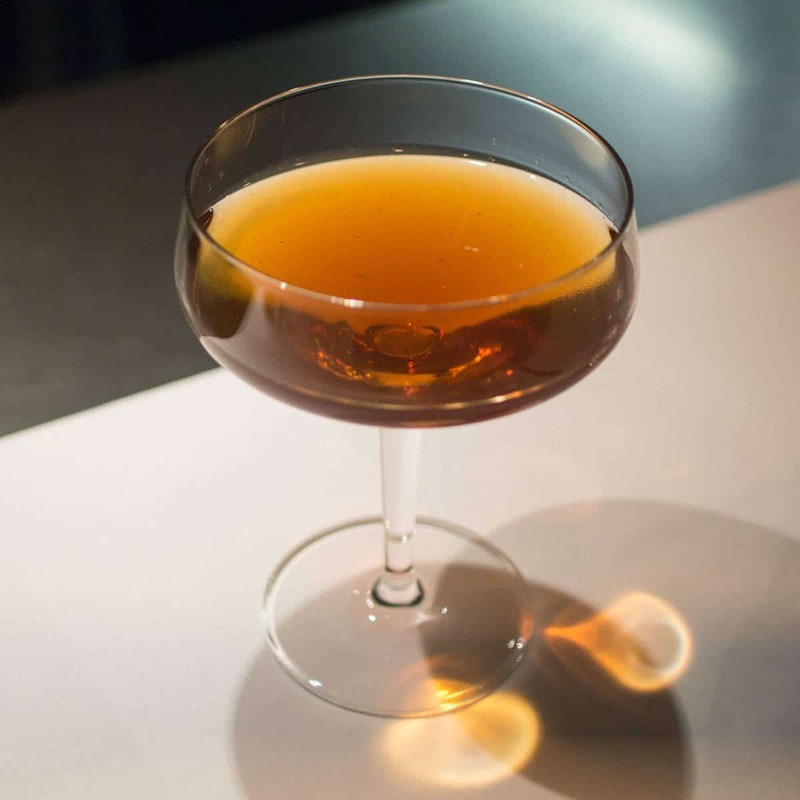 This cocktail was strong and spirit-forward featuring whiskey and maple syrup in careful balance. It was so good and had the perfect level of maple sweetness to counter the straight whiskey. This cocktail was very citrusy, but I was still able to taste the mescal and smoke through the initial citrus bite. This dish was super-delicate. 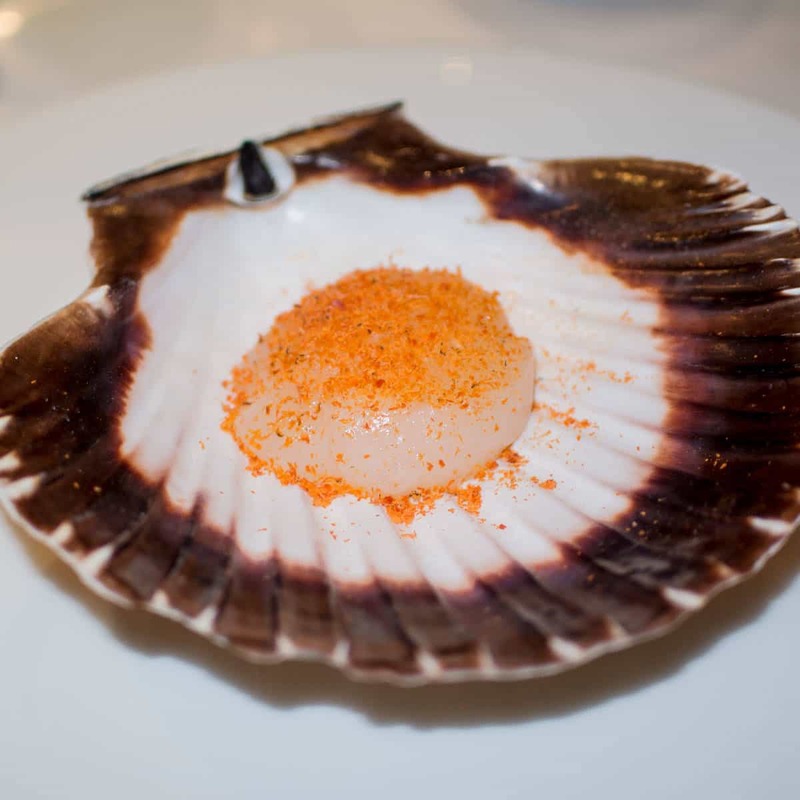 It featured a sweet and lightly briny raw scallop. 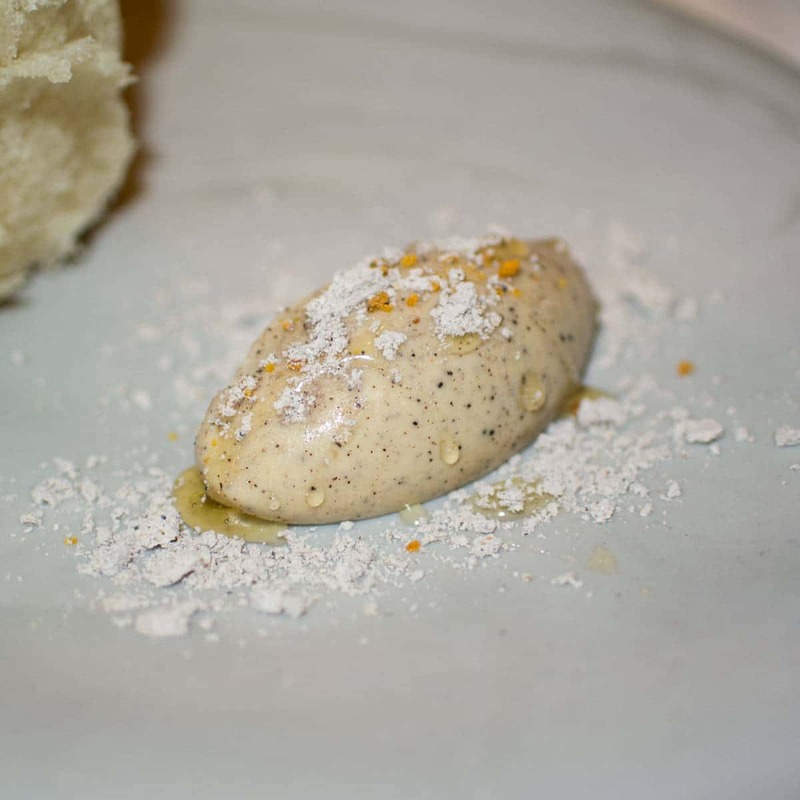 I loved the richness that mayonnaise brought to it as well as the ginger-tinged rice wine vinegar bite and sprinkle of salty, vibrant dried roe. This was kind of like a potato-flavored puffed shrimp chip like you find in Asian groceries. It tasted lightly fishy from the fish roe cream and made for a really tasty, crunchy appetizer course. The mackerel was served raw and came dressed with salt made from squid ink. 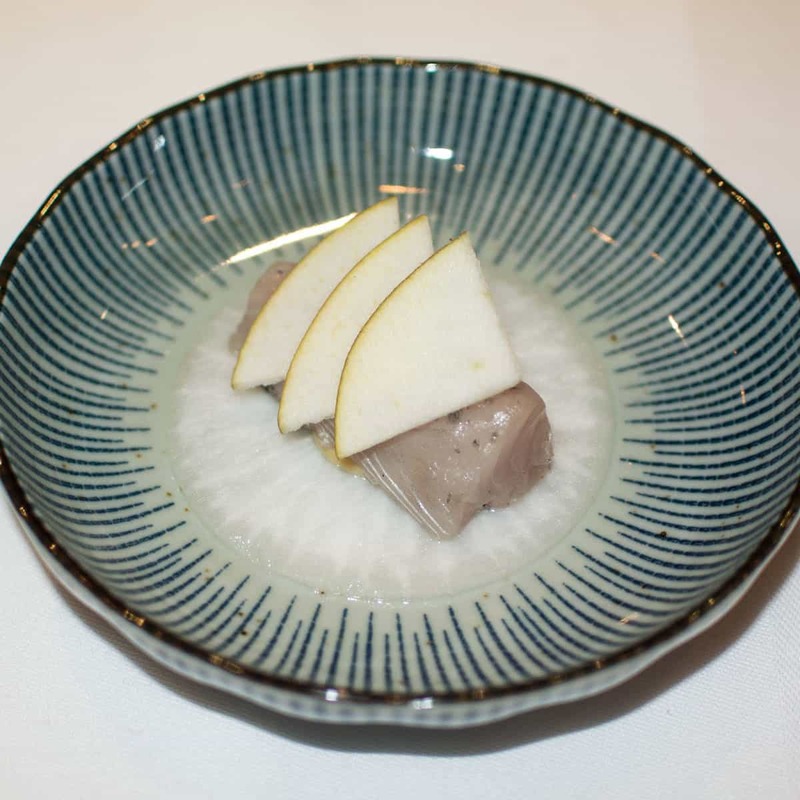 Beneath it was a thin-sliced turnip which was infused with miso and vinegar flavor. We were instructed that this dish was to be eaten like a taco. I loved the aggressive level of acidity in these bites. 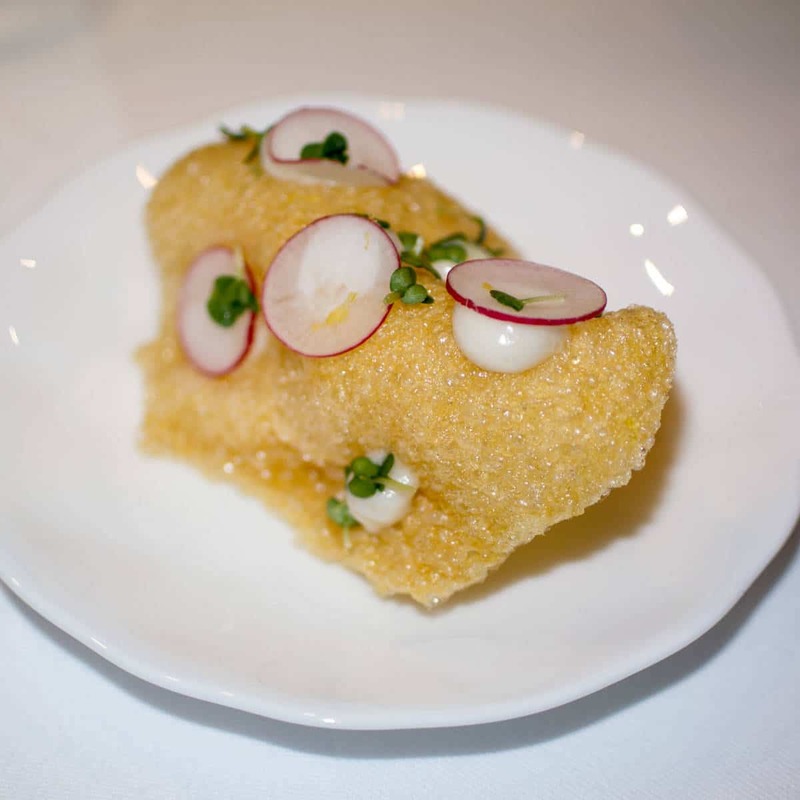 Not chicken meat, but instead featured a fried chicken skin cracker. It served as a crispy surface for the creamy topping. The spread was made with rosemary mascarpone and got a salty punch of meatiness from tender, rendered cubes of bacon bits. This was the best dish yet. 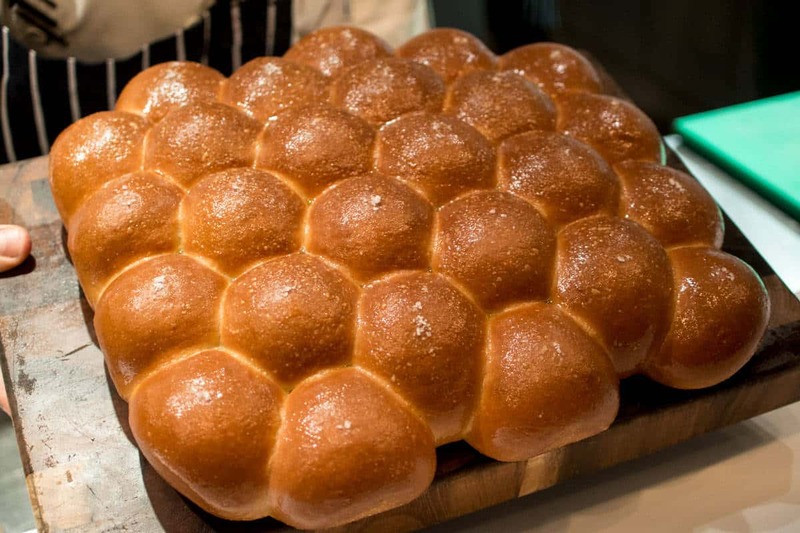 A Parkerhouse is the name of this particular type of roll. It came fresh of out the oven looking absolutely spectacular. 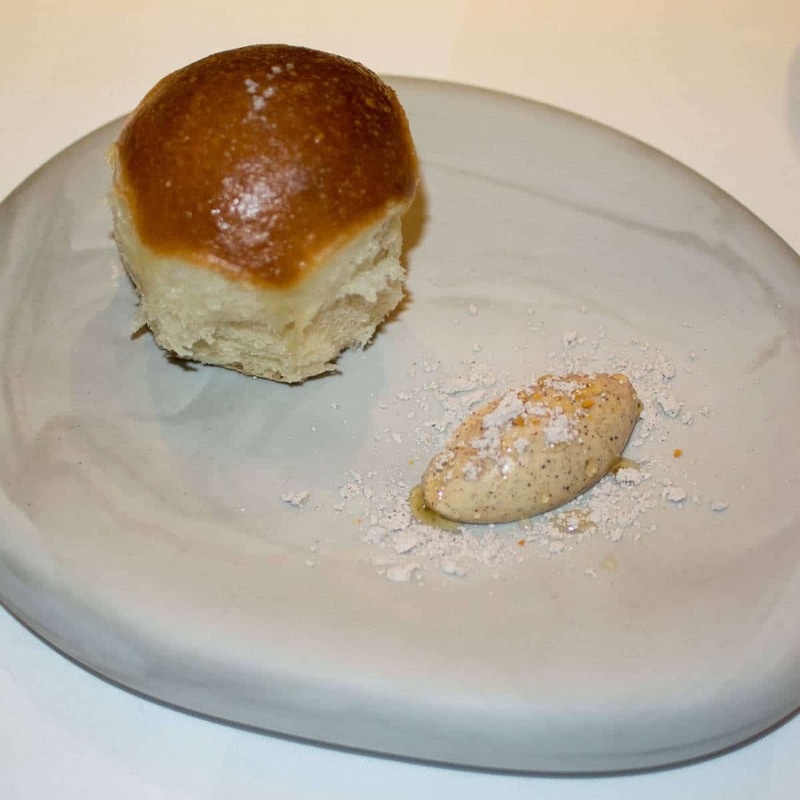 It was a super-fluffy type of bun served with a very light, bright cocoa-inflected butter topping. There was a wonderful level of salt sprinkled on the top surface of that crispy-crusted roll too. Together, this was just ridiculously delicious. 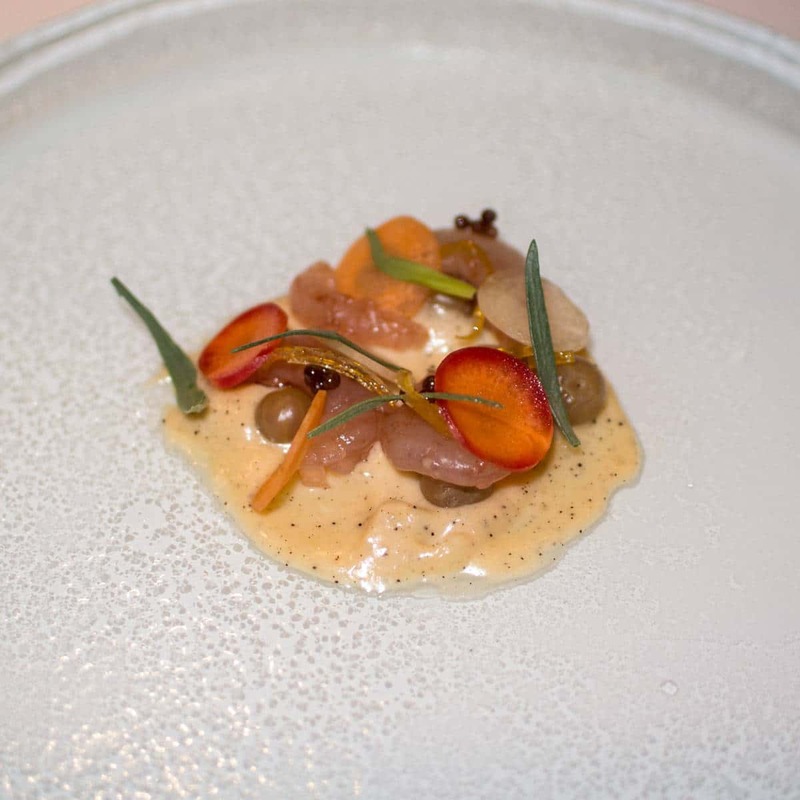 This dish was made with tiny local shrimp served raw in a bold, creamy, rhubarb vinegar with pickled vegetable slices. It was a very peculiar dish — a sort of seafood salad — but still very delicious and tasted almost American Southern-inspired. This was a very oceany-tasting broth — not in a bad way though. 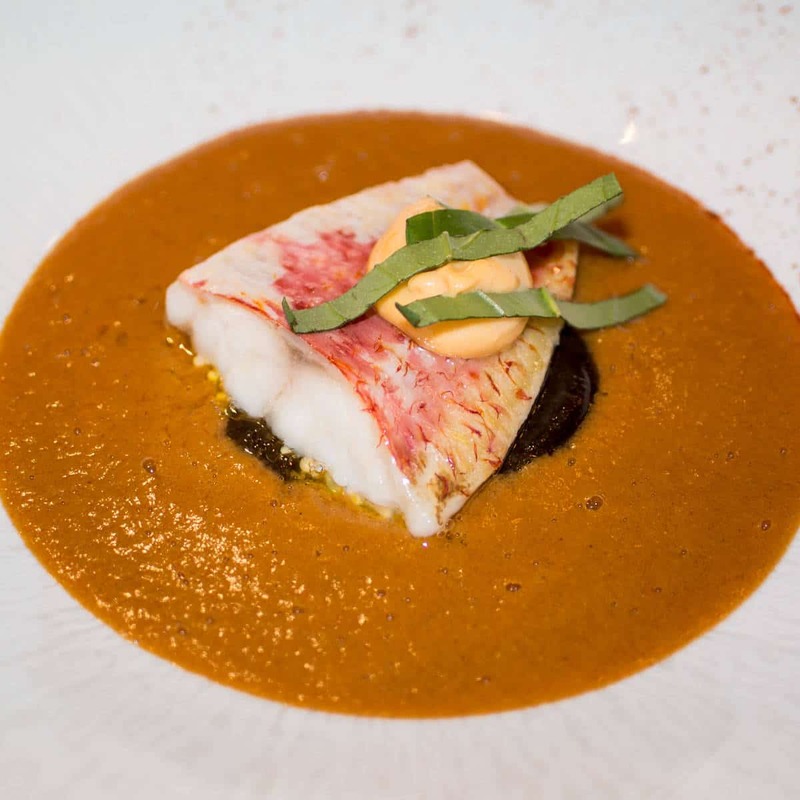 They called it a “bouillabaisse” and they said that they used the shrimp heads from previous course to build the broth. In the broth, there was perfectly cooked fillet of mullet from town of Cornwall. The dish has a nice heat from harissa, tang from black garlic, and herbal quality from basil, which all came together really nicely. 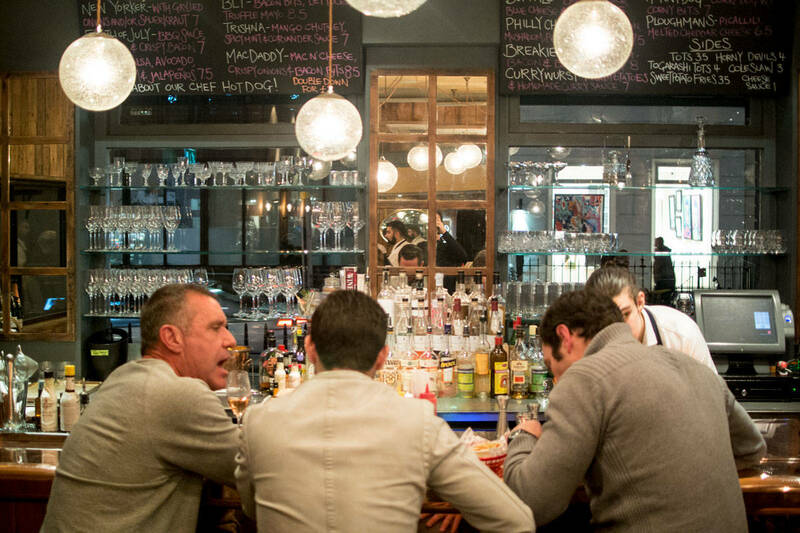 There was almost a French-Cajun vibe — outstanding. I’ve had pork chops before. I’ve had lamb chops before. I’ve even had goat chops before, but never before deer chops. These were also sourced from the town of Cornwall and had a sweet and sour, yet creamy combination of flavors. The tiny blooming Brussels sprouts were charred, and it was all served in a yogurt sauce that was sprinkled with dried black currant. Very unique and very tasty. The deer course also came with this dish. To me, it tasted like a gamey pastrami soup. I know that sounds weird, but I absolutely loved it. 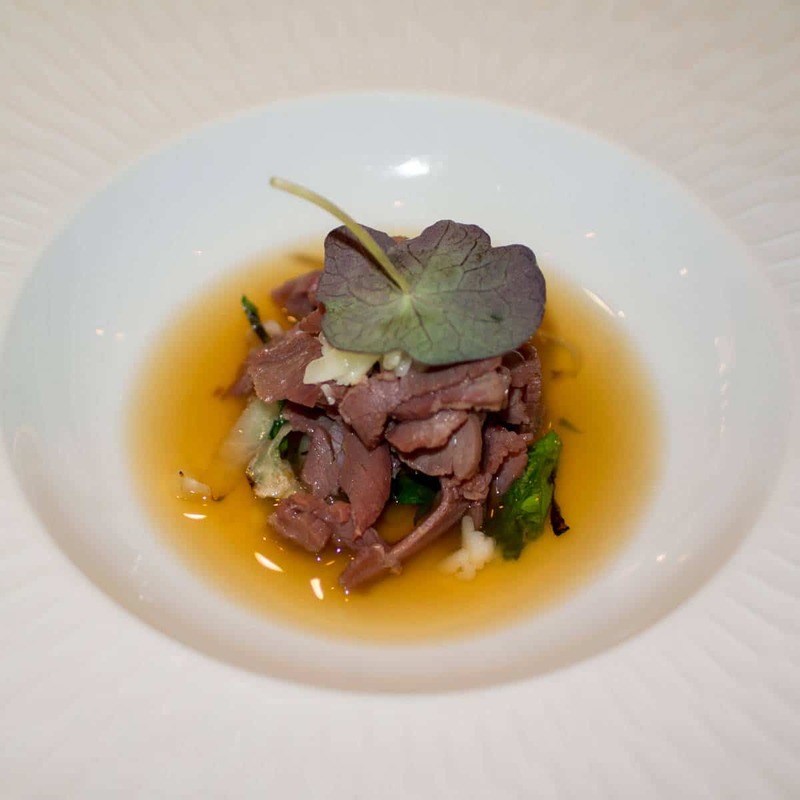 It was made from sliced deer belly with grilled cheese, grilled sauerkraut, a meaty broth, and a bit of parsley for contrast. This was totally amazing. 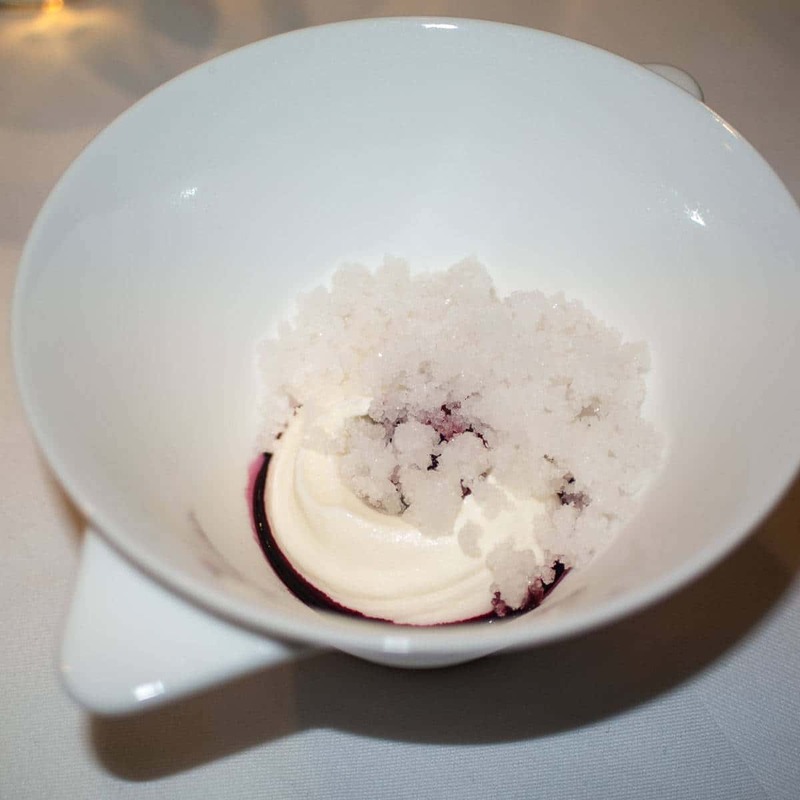 It was a sour cream ice cream served with beet liquid and diced beetroot. There was a real subtly to the flavor profile here, even with the addition of tea and woodruff granita in the bites. 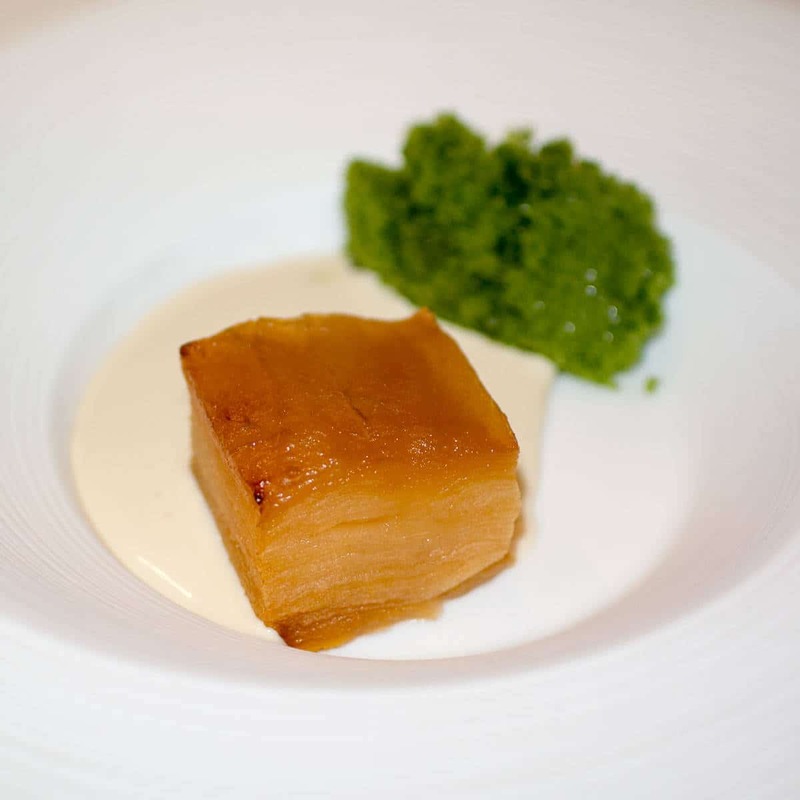 Together, the ice cream and woodruff granita created a wonderfully rich, musky flavor. This course was foamy, cold, and very restrained in flavor. 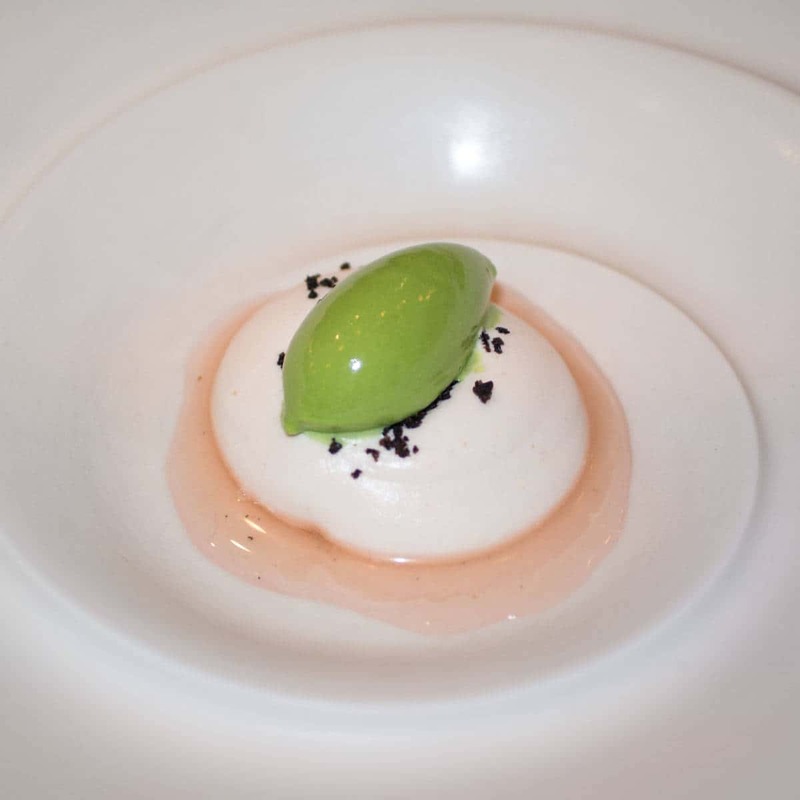 It involved quince foam, quince poaching broth, an intensely herbal flat leaf parsley ice cream, and got a touch of crispy saltiness from dried black olive shavings. Quince isn’t exactly easy to describe, but in this preparation it had a a sort of mildly orange / apple / pear flavor. The second dessert course involved extremely thin-sliced apples which were formed and pressed into a trifle after getting soaked and pressed with caramel. It was served hot with chamomile cream which added a tea-tinged flavor to the dish. It also included an ice-cold sorrel granita that was boldly vegetal and absolutely amazing. Finally, this incredible closer. It was so amazingly rich. 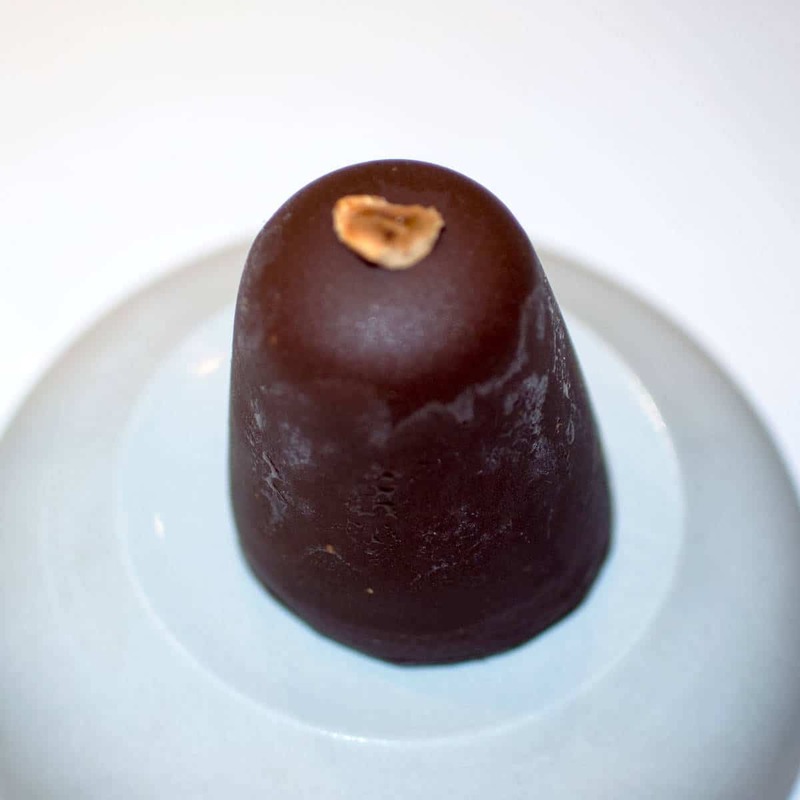 It had caramel ice cream inside of an amazingly rich and sweet chocolate exterior. 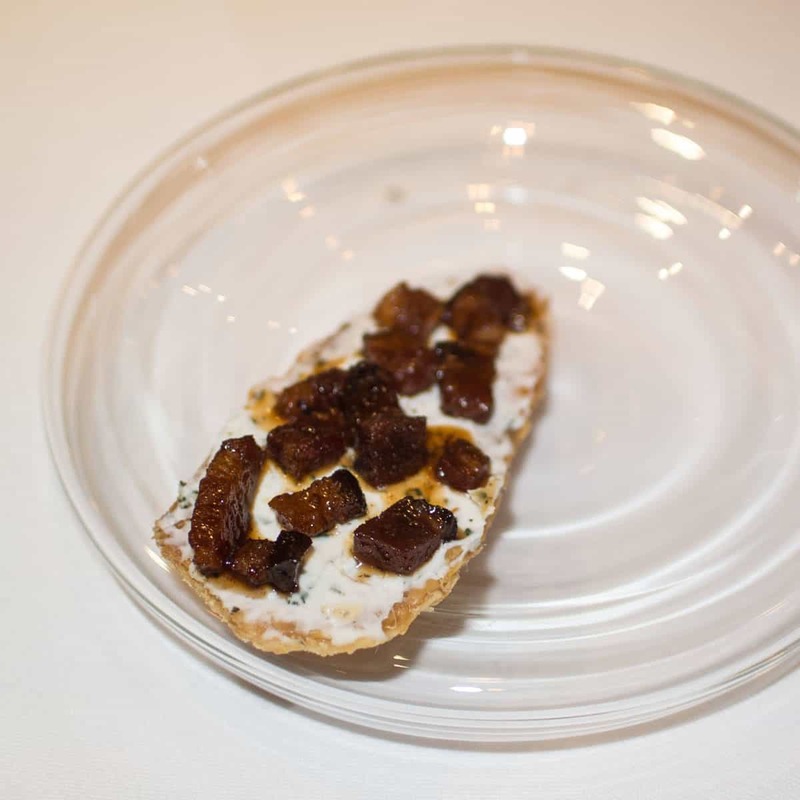 It came topped with a caramelized hazelnut and had a base made of crumbly cookie. This was also ridiculously good and a phenomenal was to conclude the meal.